I can't really tell you what I did yesterday, but I can guarantee you that, for most of the day at least, you would not have wanted to be me. After a long work day that began with conflict, and mostly carried on in that same tone, you have to really take note of what's important. Every day I walk with the guy you see on the left. 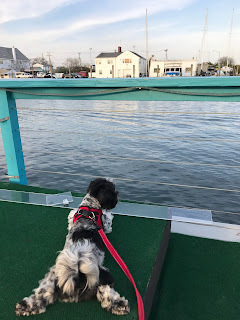 We walk up the streets, all the way around a waterfront park, and then we walk most of the Nautical Mile. Somehow, no matter how many awful arguments I've had, no matter what outrageous behavior I've witnessed, no matter what injustice I've endeavored to address, my pal Toby shows me what's really important. This is the deck of a closed restaurant in Freeport. Toby and I have been walking around it most days lately. It's a shame, with such a great location, that no one can figure a way to keep it in business. Nonetheless, like many restaurants, it's a whole lot more canine-friendly when it's closed. Aside from the canal, bright moments in my day included those in the classroom. A classroom is never a perfect place, except in the fevered imagination of Charlotte Danielson, but it's always a place for innovation. Even when students are a pain in the neck, there's always a way to deal. There's just that small matter of figuring out what it is. Several of the boys in my class have been repeating things I say. That's not a bad thing in a language class. Often it's productive and natural. Some boys in my class have been ridiculing my pronunciation of Chinese names. I probably am awful, and I probably deserve it. But lately they've been loudly repeating when I call girls' names, and not strictly Chinese ones either. This really irritated the hell out of me, and I couldn't figure out exactly why. I spoke to a guidance counselor yesterday, and she said that was bullying. I don't know why I didn't think of that. Making fun of people's names? She said she'd call them down. I'm sure she will. Later, when one of the boys called one of the girls' names I took him out into the hall, and I told him, "You will never repeat that girl's name again in my class." I said nothing else. I'm not really sure he understood exactly why. I guess the counselor will go into more detail. But I'm certain this will stop happening. This morning, when Toby and I go out, I'll tell him the story. There's nothing Toby likes better than a good story, except chasing a ball, chasing a squirrel, chasing a bird, eating a dog biscuit, or going for a walk and allowing me to believe he's listening to my ridiculous stories. Man look at that thing on the street, in the grass, on the wall, on that lawn, in the water, over here, over there. Toby and I begin and end every day with a long walk just to keep it all in perspective.